Last night I had cooked up a pot of chickpeas, drained them and put them in the fridge. I had no immediate plans but figured I’d use them in a soup or stew sometime in the next few days. But then lunchtime rolled around and I was getting a hankering for some good eats. Ages ago, I had bookmarked a chickpea sandwich recipe on Smitten Kitchen and when I gave it a look over, any questions about what to eat were solved. A smashed chickpea salad sandwich coming up! The recipe is really a cinch to prepare and it’s got a serious case of tangy with all that lemon and caper business going on. But it’s also got some creamy mayo in there too to help smooth things out a little. The original recipe calls for olive oil instead of mayo but I was all out because I only get my olive oil from Tosi & Co, the oldest Italian market in Chinatown and the shop been closed for about a week now. It makes me nervous to think about it and I’m crossing my fingers that it opens again soon! But I loved how much that dollop of mayo did for this salad. I added in capers instead of black olives, though I think that would be a great choice too. But the biggest bonus for me is the juice of a whole lemon. I used a rather juicy lemon and I loved the super lemony sucker punch it gave, but feel free to tone it down to just a half lemon if you’ve got timid taste buds. I made sandwiches for me and Cornelius on rye toast and I couldn’t get enough, so I made another. This is a bit of a drippy sandwich, so I even licked my plate. I have no manners, but I sure can appreciate a good sandwich. Yeah, this is the good stuff. So good, next time, I’ll forget about the bread and just eat it as is, salad-style. Alone. And happy. elsewhere: This week I go ball-istic over at Poppytalk and make a recipe for veggie balls. They’re great! Also, you have to make this creamy asian veggie slaw that converts slaw haters. It’s delicious and I make it often. Enjoy! In a medium bowl, dump in your chickpeas and use a potato masher to smash your chickpeas. This shouldn’t be hummus texture here – just smashed with some whole chickpeas and a lot of roughly chopped ones. Stir in the red onion, pepper, parsley, capers, lemon juice and the remaining ingredients. Taste & adjust seasoning if needed. Serve on toasted bread or crusty rolls or just eat as is, salad-style. Makes 4 servings. « get ready, thanksgiving is coming up this weekend! I’m always on the lookout for alternative sandwich fillings.. this one looks like it would be a nice change! Huh! I would have never had thought to put chickpeas on a sandwich before. Looks like a must-try. Yum! I love chickpeas and I’m definitely going to give this a try for lunch. Thanks! Oh man, why have I not made this sandwich before! Sounds amazing, thanks for sharing! Oh my goodness. I feel like I need one of those right now. Good Lord, that sounds, and looks, so flipping delicious. I have heaps of cooked and frozen chickpeas – thanks for lunch today! I would so put that in a heated wholemeal pita bread. It’s one of my favourite things to use to make a sandwich. I keep them in the freezer and defrost in toaster. Less bread, more salad! You’ve done it again, these look so delicious. We’ll be trying these. Thank you. I had bookmarked this a long time ago, and totally forgot to make it! It looks so fresh and delicious. This has reminded me to try it once again! Ooh! 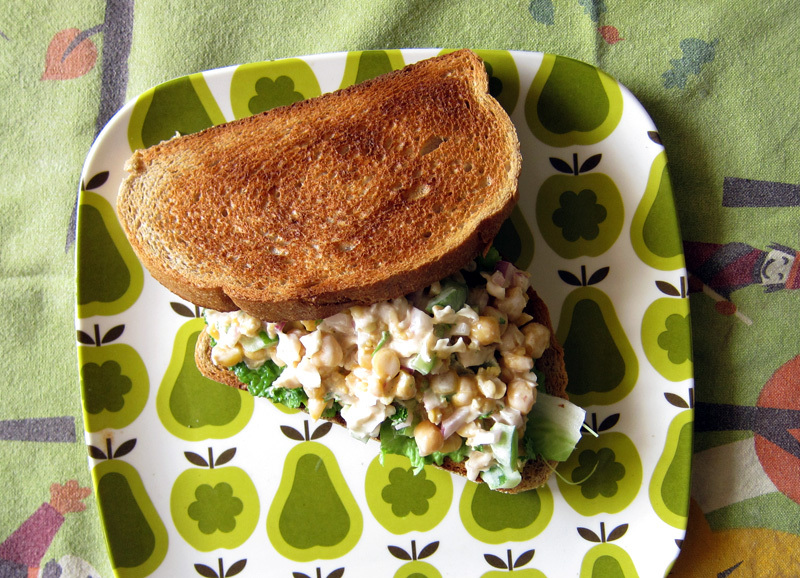 I’m always down for learning new ways to use chickpeas, plus this looks like a fun vegetarian spin on tuna salad. Is smashing the chickpeas as fun/therapeutic as it sounds? I always say that I don’t like sandwiches (sorry!) because most of the veggie kind are so bad. But this is totally my cup of tea. Love it! This looks amazing, I love me some chickpeas (I’ve always got them in the house in some form or another) I’ve got to try this! My mouth is watering and I want this right now, but I haven’t even had breakfast! 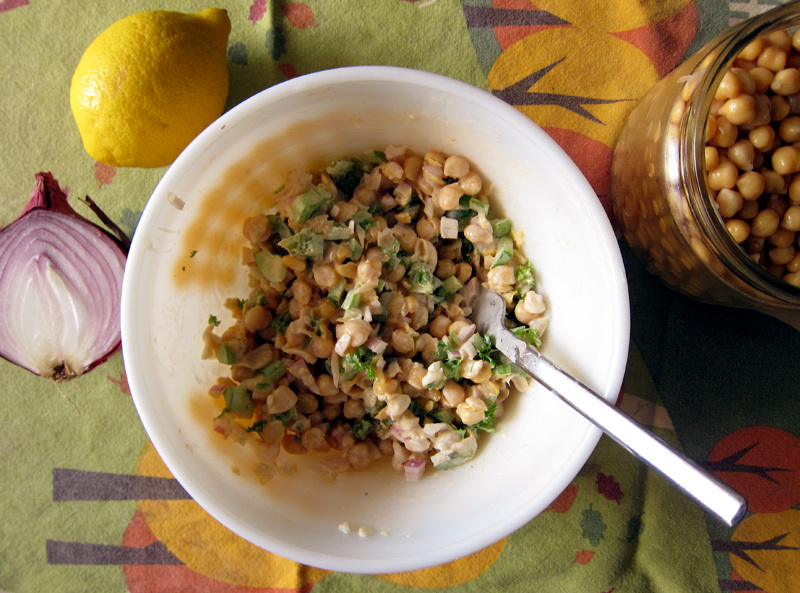 I love chickpeas, lemon and capers. I think it would be great, and maybe easier to eat some in yummy fresh pita ‘pocket’…. maybe some arugula. Well, at least I know what’s for lunch! I LOVE anything tangy! This looks so good – definitely bookmarking this and making for lunch sometime this week! oh my goodness this looks good. i just finished up my chick peas looks like i will need to boil some more. 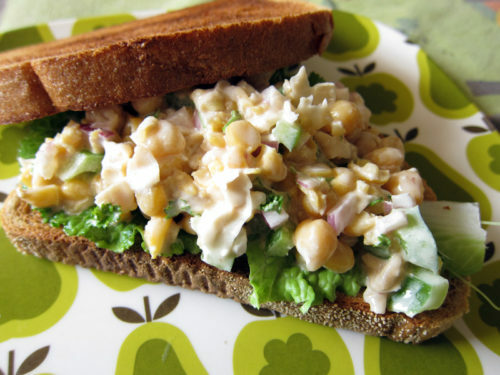 Reminds me of Chickpea of the Sea from Kripalu, a great sandwich filling, the photo looks yummy. I generally hate mayo-based salads but I’m thinking with all the briny salty mix-ins to this salad, I could learn to love it! That looks so delicious. I Love mayonaise. I always have to cut it out or down, but the added creamyness of the chickpeas is brilliant. Thank you! I have the goods to make this sandwich. Just bought a new jar of mayo yesterday. And I’ve been soaking a mason jar full of dried chickpeas for 2 days now, and continuously changing the water but those little buggers refuse to soften up. I think dill would be another good herb to add to your ‘chickpea smash-up derby’ sandwich LOL! I saw this on Smitten Kitchen too and never made it, but it was inspired by a sandwich from ‘Wichcraft, which I considered ordering for the plane when I was at Wichcraft in San Francisco last week. When I had a 2+ hr delay and had to order a crappy overpriced sandwich at SFO, I sure regretted not getting it. I’m going to have to make this now! I get flats of canned chickpeas at Costco so I always have some on hand. This looks incredible! And I love that third image, something about all those colours together. Really nice work! I’m drooling already! I made this tonight, but used the olive oil instead of mayo and added chopped green and black olives. It was great over parmesan couscous with steamed carrots on the side. Grapes and pears for dessert! Thanks for another winning recipe. Think I will eat the leftovers tomorrow with a dab of mayo on bread. YUM! So happy to see all these comments gather over the weekend (& me away from the computer for once). Thank you for all your responses and I hope you give this tasty lunch a go. currently inhaling this delicious sandwich! thanks for this, I can tell it will be in regular rotation now that I’m not eating meat and sandwiches have lost a lot of their appeal. Reale, the smashing is the fun part however, I’m sure you had a great tasty meal, so you’re forgiven. Thanks so much Dori for commenting! Glad you liked this meal and yes, I figured that greek yogurt would be a good sub for the mayo – glad it worked out so well. Kate, I’m so glad you inhaled this sandwich – it’s a goodie. So glad you’ve got a new sandwich now that you’ve gone veggie. Hooray! What a great vegetarian option! I am always looking for new options for my Veggie friends!!! Yum! I love chickpeas, I love capers and I absolutely love to try new sandwich fillings so when I try it I will be back to tell about it! Thanks for sharing this. Thank you for this gorgeous recipe and to all who tweak. Does the capital “T” mayo/parsley mean tablespoon and the “t” capers mean teaspoon? Yumm you make this sandwich sound and look so good! Great idea swapping capers for olives. Clare, yes, T = tablespoon and t= teaspoon. Hope it helps! Ashley, I love capers and that’s what I had around – it worked really well (though I think olives would have been lovely too). This is an answer to my chickpea supply! I also like tangy, and the option to use olive oil instead of mayo is an appealing healthy alternative. I have to admit my first encounter with capers was a precarious one (didn’t like the fish so much), but maybe I’ll have to give it another try. Also, congrats on being selected food blog of the week by Gourmet Live!! Delicious. The mayo binds everything together and makes it addictive. I made this, as the appetizer for an all-Pleat vegetarian dinner. I think there’s about 1.5 cups of chickpeas in a can, so I upped everything by 50%, which worked. My vegetarian dad, whose happiest moment at a restaurant is when the bill arrives, and who would eat oatmeal, hell, cold unsalted and overcooked oatmeal as his only staple and be perfectly happy for the rest of his life, proclaimed this to be an “excellent” dish. I served it as-is , and I think the leftovers will be used for lunch with wheat toast. Yum! This looks really good. I just made an amazing chickpea spread from a recipe over on The Kitchn (search Chickpea of the Sea). Love chickpeas any which way!! My boyfriend and I made this for dinner tonight and it was amazing! We did not feel like cooking (okay I didn’t feel like cooking) BUT ANYWAY, we omitted the green pepper and added a boat load of dried dill. Totally adding this to the work week sang rotation. Thanks! When you first posted this, I was 19 and not really sure how to tackle feeding myself in a way that was healthy and cheap. This was the first recipe that I got from your blog (the first of many!) and it’s on a regular rotation in my lunch repertoire. The cool thing is that this recipe really helped me feel comfortable experimenting with foods that I wasn’t familiar with. It inspired me to play around with food! So, yeah. I made this recipe today and thought about how much I’ve grown as a young chef because of it, and I wanted to thank you. So thanks. Just made this! So yummy!